There’s a saying in boating circles that suggests that the best boat is always sombody else’s. That is, a boat you can play on, but you don’t have to maintain/pay for. It’s called OPB – Other People’s Boats, and it can be pretty attractive. And what would be the ultimate OPB? How about a 60-ton schooner? Yeah, I think that qualifies. But that wasn’t our first contact with Cappy and the Isaac H. Evans. Oh no, and there’s a story there, of course! 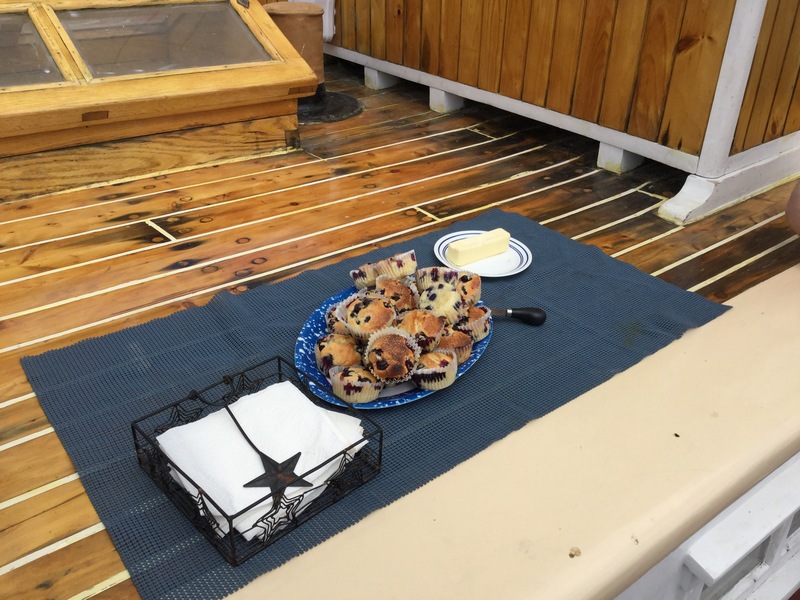 Way back in the summer of 2015, when Nicki & I first launched Sionna, we took our first overnight aboard in a little place called Clam Cove, a usually quiet spot just a couple miles north of our home port of Rockland, Maine. So we’d just finished a light supper at anchor when we noted a schooner approaching the cove, under sail, clearly heading for anchor as well. Now Clam Cove isn’t very big, and the north half of it is off limits to anchoring because of an electric cable, so it was pretty clear we were going to have some company. Sure enough, the Schooner was the Isaac H. Evans, and we had the pleasure of watching this very substantial vessel approach, drop her head sails and run her chain within 50 yards of us, all without engine, in a graceful ballet of seamanship one doesn’t see very often. We were impressed! We were even more impressed a bit later when Captain Brenda rowed over to us and inquired whether we had a dog aboard? They had a birthday party amongst the passangers, and were hoping to set off a few fireworks, if we didn’t mind? We allowed as how we’d no pets aboard, and would welcome the show, thank you for asking! But it gets better. Dinner was announced aboard the Evans, a lobster dinner with all the trimmings. Our light supper was beginning to set even lighter by this time, but never fear – “Cappy” to the rescue! Here she came rowing again, this time bearing two steamed lobsters, a half bottle of champagne and two official Isaac H Evans logo mugs! So we have a soft spot for the Evans, and her captain. And lobster. So fast-forward a year and a half, and you have this conversation between Cappy and I, suggesting we might get a chance to sail on a Maine Windjammer if the stars align properly. We let her know that we were still interested, we showed up at the dock one day – unannounced – to help with a bit of the spring painting work, and got our invitation to come sailing for their first trip of the season, a 4-day trip with only a handful of passangers but a whole load of crew and interested parties – like us! Holy Heavy, Batwoman! The rig on a schooner is heavy. Raising sail – particularly the main – is a wicked heave, best done with gloves and a lot of help. Out of Shape! The 17 year-old First Mate doesn’t look look a weight lifter, but she put me to shame in the muscles department. I need more exercise than I’m getting these days if I’m going to keep up. It’s a BLAST! Really, sailing on a big boat (something over 120,000 pounds) is an amazing experience. Nothing happens fast because of inertia, but once it’s happening, it KEEPS happening for the same reason, and you’d best plan for it. Which Captain Brenda does, really well. She sails that boat like an extension of her hand. So that’s our solution to the problem of being boatless for the summer! 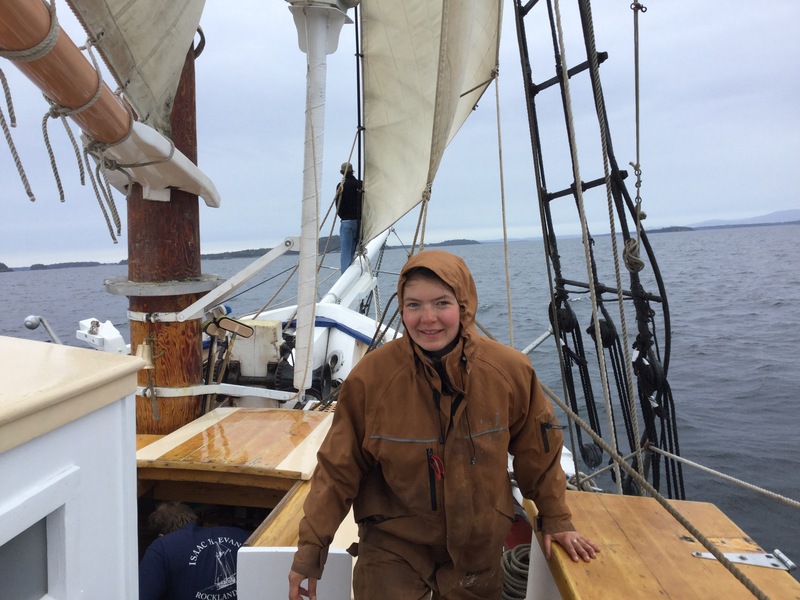 With the help of First Mate Autumn and Deck-hand Fitz (pictured below), we learned a whole lot about running a schooner, and have been invited to stand as relief crew for the summer. That means that Fitz and Autumn can get an occasional evening off, and we get to help sail a boat that was built in 1886! 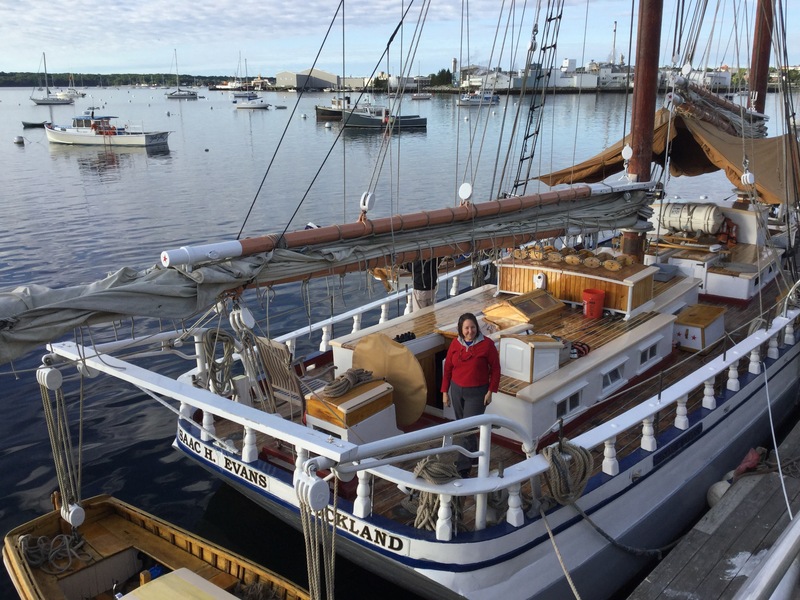 So, have you ever wondered what it’s like to sail on a schooner? 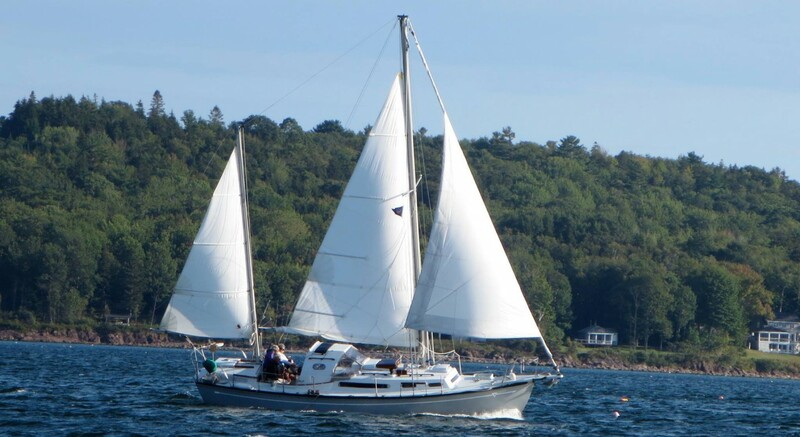 Check out the website link for the Isaac H. Evans – I promise there is no better way to see the coast of Maine! 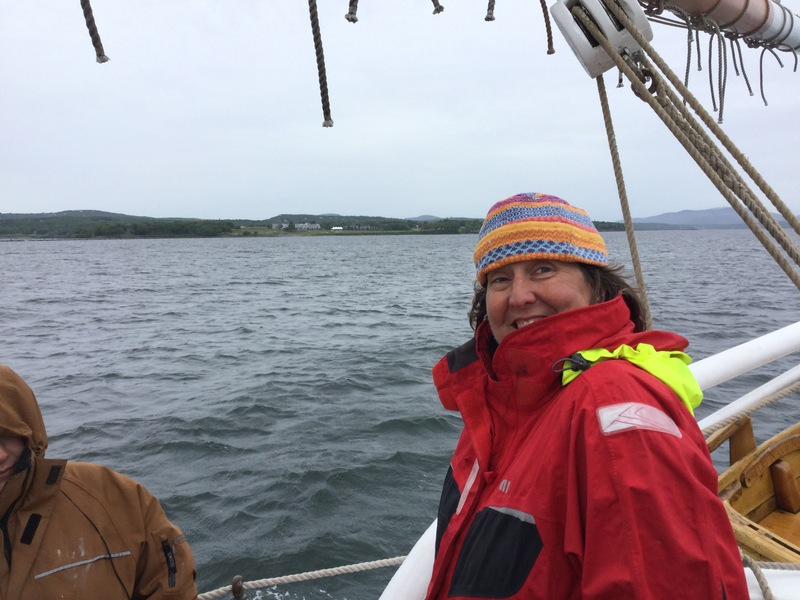 And who knows – you may even cross paths with the crew of s/v Sionna! Honfleur is for sale. Now. After I wrote the last post, I actually sat down to an accounting of the expenses we’d accrue with the care & feeding of the second boat, and had to admit that it makes no sense to hold on – as attractive as the idea may be from an emotional standpoint. Sionna must have her Genoa replaced before we can cruise again, and the cost of that sail nearly matches the cost of keeping the little boat – whether we actually launch her or not. It’s time to release those memories and move on. We have friends here in Rockland who have boats, so we won’t be entirely land-locked without the Tanzer. Farewell, Honfleur. May you find a loving home and able hand for your next 39 years. It’s been a lovely cruise. 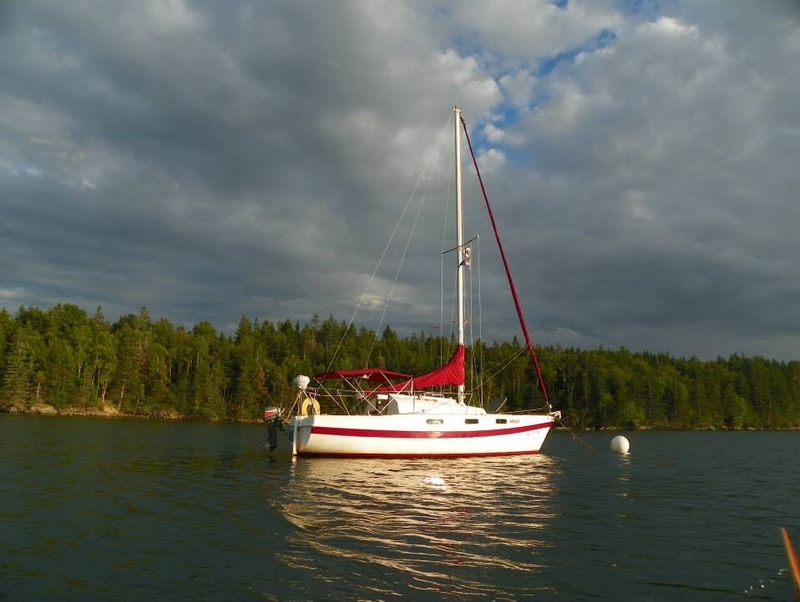 We related back last summer the process we went through of selling our prior boat, “Honfleur”. She’s a Tanzer 7.5 (meter), a basic classic-plastic coastal cruiser from 1978. I’d been given the boat back in 2008 (“If you can get her out of my pasture, you can have her!”), and had sailed her every season since, until we bought Sionna in 2015. 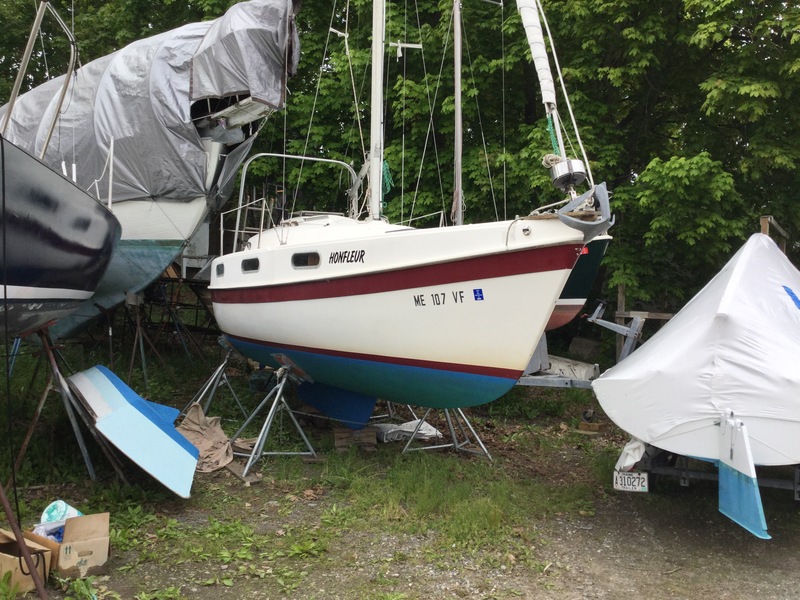 Clearly we didn’t need two boats to maintain, so it made sense to find her a new home. 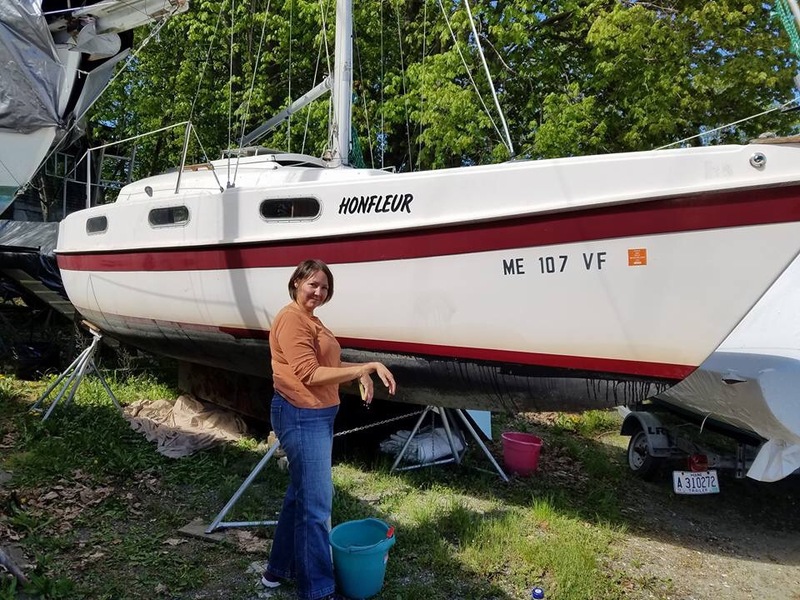 The buyer who found us was motivated and determined, but lacking in experience and knowledge, so we spent a good bit of time preparing both the buyer and the boat before we left for our cruise. Sadly the burden of boat ownership became overwhelming as other life challenges presented, and eventually Honfleur came back to us – a little older, a little dirtier, but basically intact – so we’re a two-boat family again. Eventually I expect we’ll try to find her a new owner again, but for now, we’re feeling like we owe her better than we’ve given her lately. We’ve been cleaning and painting the bottom and putting things in order, intending to launch her soon, and do a little small-boat sailing this summer, right here close to home. Small boats are fun, and though she used to feel very big to me, after two years aboard Sionna she seems quite small indeed! 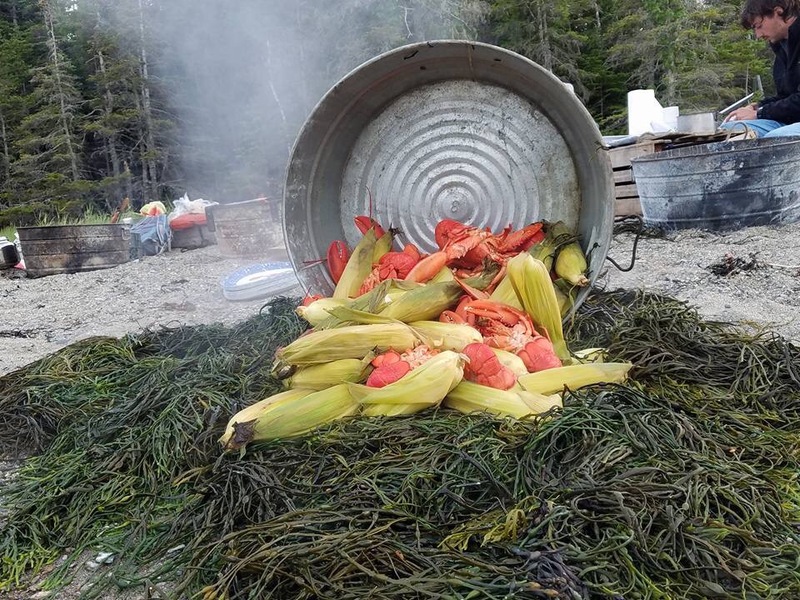 Since we’ve lived on land our entire lives until recently, one would think that we’d make the transition back to Maine seamlessly. Sadly, no, as I began to describe in the last post. Certainly part of it is the simple sensory overload of living in a techno-focused consumer society. But an equal measure must be laid at the feet of finance. 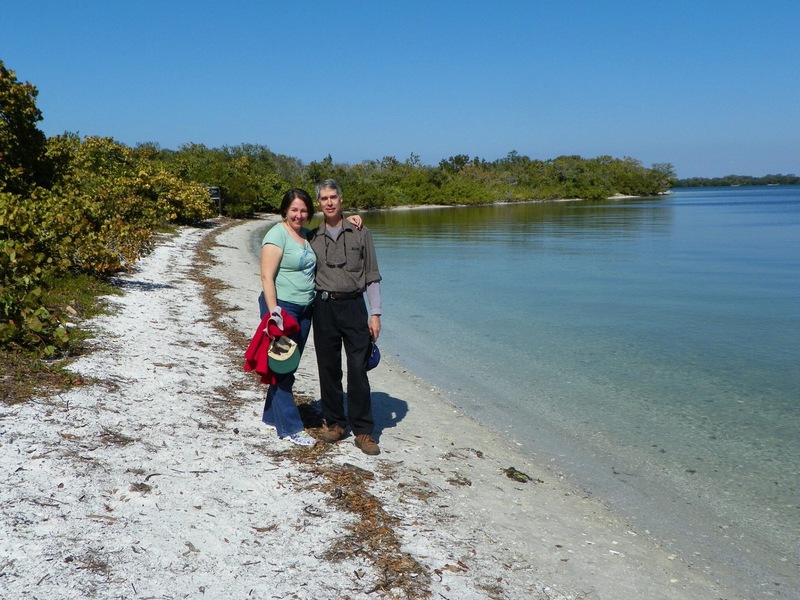 It is incredibly expensive to live ashore, and we are, at the moment, at the ebb point of our income season. Carpenters work outside, and the weather in Maine the last four weeks has been cold and wet in a way that’s unprecedented in living memory. If we can’t work, we don’t get paid, and in this cold, we can’t work. But of course the expenses don’t stop. Insurance, medical bills still outstanding, repairs to both cars when we got back, a dental emergency… They just keep coming. 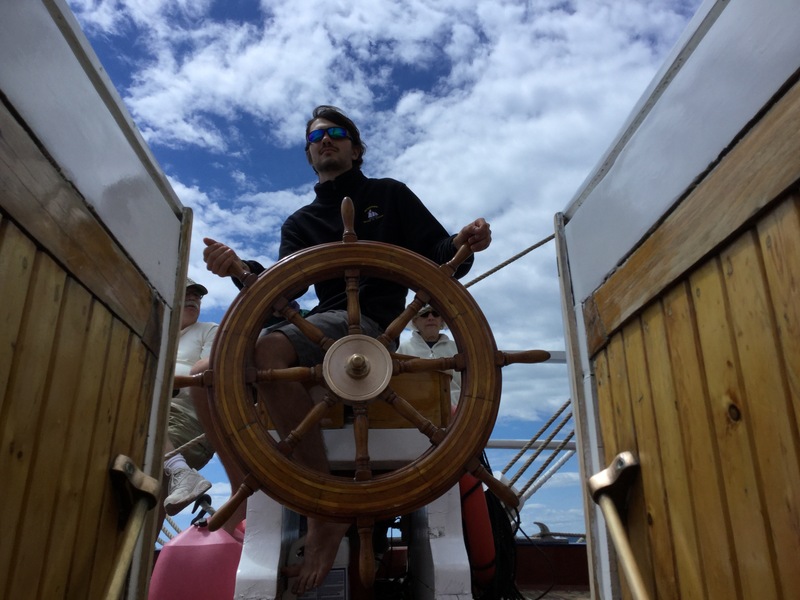 It’s my desire to guard against this blog becoming a whining lament of all that goes wrong in life, but it occurred to me that many sailing blogs – probably far too many – concentrate on the good times at the expense of an accurate portrayal of “Cruising” as a lifestyle. Perhaps that’s human nature: We feel a need to justify our choices in life, and the better cruising sounds, the easier it is to answer those for whom the very concept is anathema. When others think we’re crazy, we get defensive. Living on the boat was so much easier. Living on the boat, most things make sense. 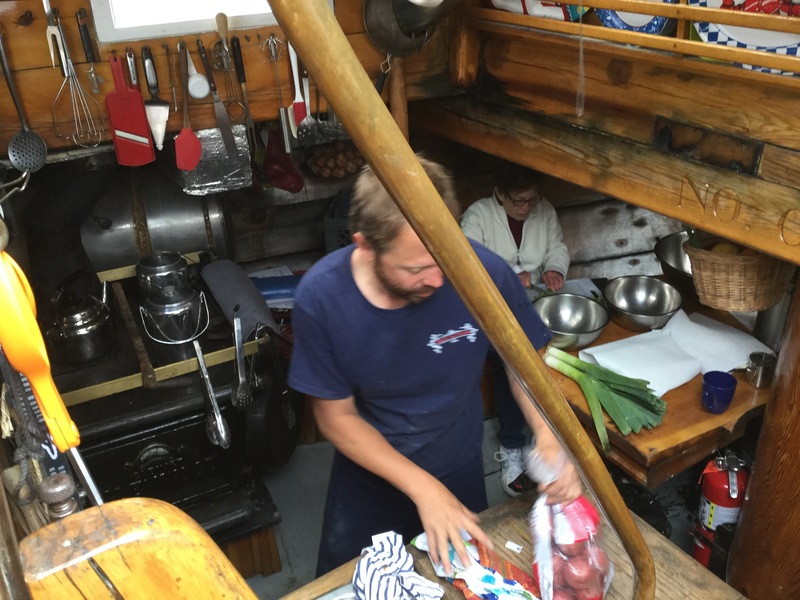 Living on the boat, most of the challenges can be successfully managed by the two of us and some ingenuity. At least, that’s how it seems when I’m freezing my tush off in New England. Happy Spring! Categories: Cruising, Land life, Social | Permalink.